Angelina Arora (Innovator to Market): And read about Angelina’s development below! The winners of the 2018 BHP Billiton Foundation Science and Engineering Awards. 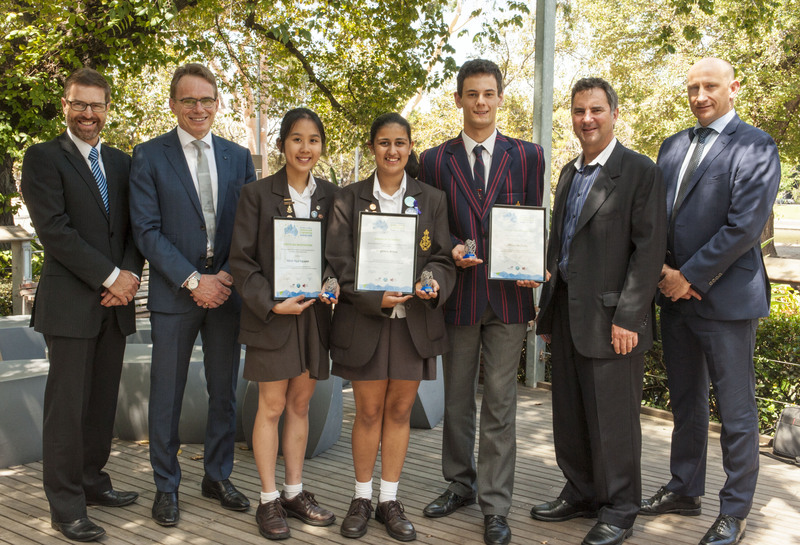 For the students in the BHP Billiton Foundation Science and Engineering Awards, age is just a number. While the awards are old school, being almost triple the age of this year’s teenaged finalists, the spirit of innovation knows no age. From saving the planet from plastics to deactivating landmines, five of this year’s 26 finalists have created some amazingly cool devices. Ants are a nuisance, interrupting your weekend picnic or invading your pet’s food bowl. But Madelaine Whip’s Anty-Nix Picnic rug provides a simple solution to solve these problems. Utilising natural oils, Madelaine has designed a safe and sustainable method for repelling ants. Concerned about the damage plastics do to the environment, especially in the ocean, Angelina Arora set out to develop a bioplastic made from prawn shell and sticky protein from the silk of silkworms. The plastic completely degrades leaving nothing harmful behind. She tested the strength, elongation, clarity, solubility, deconstruction and endurance of the plastic as well as other plastics made out of potato, corn and tapioca. Angelina hopes this plastic could replace current plastic shopping bags and other packaging to reduce the environmental impact in landfill and in the ocean. Landmines continue to be a huge cost and hazard in over 58 countries, with one de-miner killed for every 5000 successfully removed landmines. It was this that motivated Jack Chapman to develop the Electroduino Mechanical Bionic Hand (EMBH), an inexpensive remotely controlled robotic hand that can accurately and effectively detect and disarm landmines without putting human lives at risk. Like most people in South East Queensland, Lachlan Zidar has spent a lot of time around water. After discovering two-thirds of children who drown in pools are the result of an accidental fall, he developed the Laser Activated Pool Alarm System (L.A.P.A.S). The L.A.P.A.S systems works to save the lives of young children by projecting a laser beam across pool enclosures, notifying people nearby if the beam is interrupted. Due to her age and health issues, Kavinya Welikala’s grandmother is at heightened risk of having a heart attack or stroke. Not satisfied with current technologies designed to alert emergency services and family members of a medical emergency, Kavinya set out to design something more effective. Combining mobile technology with heart rate monitoring, her system aims to alert emergency contacts of heart attack and stroke at onset without the need for human intervention. It is hoped that this technology will reduce the effects of heart attack and stroke and at-risk give people more freedom and peace of mind. The BHP Billiton Foundation Science and Engineering Awards are a partnership between the BHP Billiton Foundation, CSIRO and the Australian Science Teachers Association. Six of the finalists will have the opportunity to go to Intel International Science and Engineering Fair (ISEF) in the US where over 1800 high school students from 75 countries, regions and territories are given the opportunity to showcase their independent research.